I awake at four thirty am. I toss about till five thirty, I don't know how to sleep in. I want to have breakfast but breakfast doesn't start until six. I am ready to leave, ready to hit the trail. I take my last shower for a while. The last couple of days while I've been sitting around and resting with my shoes off I've noticed that my feet are all dried out and I can feel little cracks developing that want to start hurting. I find a packet of antibiotic ointment in my kit and smear it on the cracks. Then I use some of the tape that I didn't want to carry because I thought I didn't need it to tape over the cracks. That feels a lot better. I have a large breakfast including a waffle smeared with as much peanut butter from my jar as I feel I can eat. The breakfast area is filled with people. Everyone wants to get an early start to their day. Mammoth Lakes is an upscale resort area and it looks like all of these people are enjoying the resort aspects of the place. I am the only one here dressed in shabby thru-hiker clothes. After breakfast I finish my packing and checkout of my room. Off to the trail. Well, maybe not so fast. I walk across to the trolley stop. Trolleys don't run until nine am! Nine? The first shuttle to Reds Meadow arrives there at seven thirty. It leaves from the Bike Park. In order to get to the Bike Park I need to catch the Bike Park shuttle at the main lodge. The lodge is a fifteen minute trolley ride from this stop. But no trolleys will be here till nine. Ok, I can always walk. That's what I do, it's my job. I head up the road to the main lodge. After an easy twenty minute walk I locate to bus stop for the Bile Park shuttle. The first one leave here at nine am. Nine? It's almost seven now. So much for an early start. Now what? I recall finding a Starbucks around here somewhere. There is a guy working this morning at this early hour. He's kneeling on the ground in the front corner of his truck painting the curb red with a tiny roller. It's Saturday! He's intent on doing his job and he's doing it quite well. I ask him for directions to Starbucks. He confirms what my phone says. A short walk down the mall of the resort. I walk to Starbucks and arrive at six fifty seven. It's not even open yet, it opens at seven. So I wait some more. This day is not starting off as efficiently as I pictured it starting. I order an extra hot venti mocha and find a seat. Unless I think of something else I'm sitting here for about two hours. Maybe I can find an outlet to keep my phone charged. A quick glance around doesn't indicate anyone easy access outlets. Huh, that's strange a Starbucks without charging outlets. I guess people don't come to this one to work or to do school assignments. This is a resort. I get impatient sitting in Starbucks. Especially without an outlet. I meander back through the mall to the bus stop. I sit on the steps in the sun enjoying my mocha. Schweppes walks up and asks about the bus. I point to the sign that shows the first bus to the Bike Park is at nine am. He goes an sits on a bench to wait. I look at the hole in my pants on my right knee and decide to try and fix it with tape. I pull the tape out of my pack. Unzip the pant leg and lay it flat . Then cut a piece of tape and stick it to the inside. The I press it flat. After I re-zip the leg back on I press the tape against my knee. My thought is that the tape sticks better if the adhesive is warmed to body temperature. I put the tape away and I'm pressing my knee when I see a bus pull up that says ‘Reds Meadow.’ Hey, that's the bus I want. That's the bus that the Bike Park bus is supposed to take me to. I jump up and walk over and get in line to get on as does Schweppes. I learn that the bus to Reds Meadow picks up here until nine. If I'd have stayed in place for five minutes more rather than walking to Starbucks I would have caught the earlier one. Oh well, the consolation prize is a venti mocha. It just means I start hiking later which means I end hiking later or don't hike as far. When I arrive at Reds Meadow I see Proton, Mountain Man, Beardo, and Sweet Pea. They all caught the early bus. I chatted with them for a few minutes. They are all planning on hiking the JMT north from here. I am hiking the PCT. I think they are going to go slower because there is a lot more elevation changes on the JMT and it's more scenic. I hiked it in 2014 so I'd rather stay on the PCT. I head off to pick up the trail where I left it. The first couple of miles is ideal hiking trail. Smooth, no rocks or roots. Gradual slope. Easy and I make good time. The trail begins climbing as I approach Agnew Meadow. The trail goes right through the trailhead and continues to climb. Basically it's all uphill to Island Pass at ten thousand feet. I started at seventy seven hundred feet meaning that this climbing is going up two thousand three hundred feet. There are a few switchbacks in the beginning but then the trail just climbs and climbs and climbs. I am getting tired. I notice that when I'm tired my right knee starts to ache, not that sharp twanging pain that I was getting a few weeks ago. Just a dull tiredy ache. That's how it feels now as the trail turns west and starts to climb. I know that this trail will meet the JMT at Thousand Island Lake. It looks like I'm getting close then I see that there is another ridge to climb over. It's getting really close to my four pm end-of-hiking deadline. I'm feeling anxious, I don't want to hike anymore today. The problem is that there is no place to camp right here or at thousand island lake. I finally arrive at the lake and there are a few groups of hikers sitting on the shore. I debate with myself about getting more water. Nah, I decide. I only have a few miles to go. I start heading up Island Pass it's only about five hundred vertical feet above the lake. Even though it's not that high it still has snow, not a lot, but enough to slow down my progress. I have to cross the slushy slippery snow. The trail has water flowing on it. Where there is no water, it's muddy. My progress is slow and the daylight is burning. The pass is long and flat. With snow, ponds, and water flowing every which way. It's hard to tell exactly when I've crossed it until I'm clearly heading down the other side. I am thirsty, I am out of water. I just keep going there is plenty of water down where I want to camp. 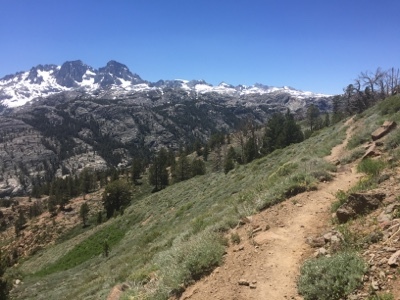 I meet a JMT hiker who says its boggy down there, pointing to where in heading. Oh no, I start to think. Then, I thought, I'll just wait till I get there. I finally reach the stream, cold clear water. I collect what I need and continue on to where I want to camp. I climb a little to get away from the stream and it's cold air. I find a nice dry, non boggy, spot in the shade. I setup camp and make dinner. All is well. I get in my tent before the mosquitoes get very bad. I fall to sleep quickly.